Following last month’s recommendation, Peter Ackroyd’s Hawksmoor, Duncan Jones has posted his second selection for the Bowie Book Club on Twitter. It’s James Baldwin’s The Fire Next Time. Here’s a couple of posts from Duncan on Twitter. Book 2 I’m going to be reading from dad’s favs, will be James Baldwin’s THE FIRE NEXT TIME. Hopefully not as hard to get hold of this book as the last, and possibly a quicker read. Can’t wait. 1st book of this reading marathon was lite on quotables, heavy on brain strain! Here’s the synopsis of a work as poignant now as it was when first published 55 years ago. James Baldwin’s impassioned plea to ‘end the racial nightmare’ in America was a bestseller when it appeared in 1963, galvanising a nation and giving voice to the emerging civil rights movement. Told in the form of two intensely personal ‘letters’, The Fire Next Time is at once a powerful evocation of Baldwin’s early life in Harlem and an excoriating condemnation of the terrible legacy of racial injustice. 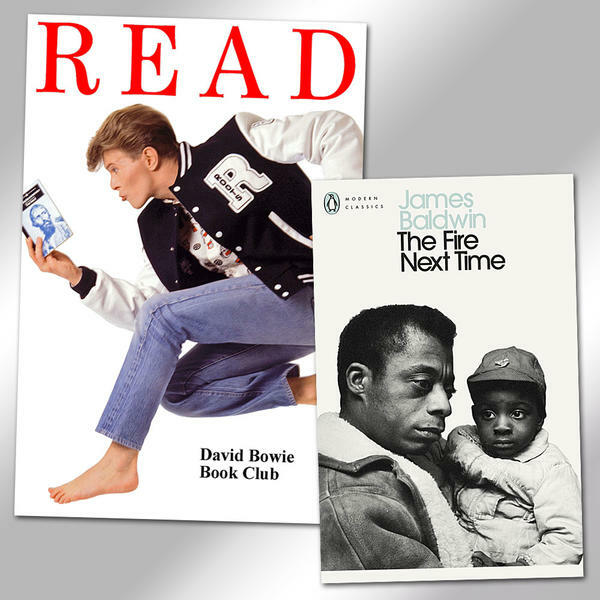 The Fire Next Time is in DAVID BOWIE'S TOP 100 BOOKS list. If you don’t do Twitter (where you can respond to Duncan directly), feel free to leave your thoughts about Peter Ackroyd’s Hawksmoor in the comments section on FaceBook. FOOTNOTE: Apologies to the American Library Association for the appropriation of the Bowie READ campaign poster from 1987.